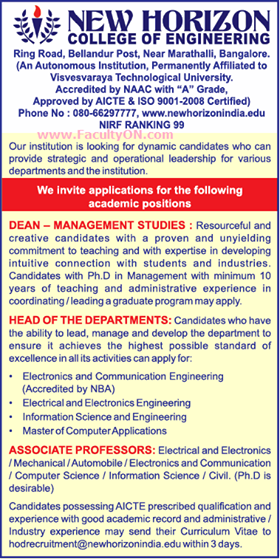 New Horizon College of Engineering, Bangalore has advertised in THE TIMES OF INDIA newspaper for the recruitment of Associate Professor plus HOD plus Dean job vacancies. Interested and eligible job aspirants are requested to apply with in 3 days. Check out further more details below. About College: New Horizon College of Engineering is an Autonomous college affiliated to Visvesvaraya Technological University(VTU), approved by the All India Council for Technical Education(AICTE) & University Grants Commission(UGC). It is accredited by NAAC with 'A' grade. The departments of Computer Science, Electronics & Communication, Mechanical, Civil,and Biotechnology have been accredited by the National Board of Accreditation(NBA). It is an ISO 9001:2008 certified Institution. New Horizon college of Engineering is located in the heart of the IT capital of India,Bangalore. The college campus is situated in the IT corridor of Bangalore surrounded by MNCs and IT giants such as Intel, Accenture, Cape Gemini, ARM,Symphony, Wipro, Nokia, JP Morgan and Cisco to name a few.